The Maitland News was a local newspaper originally published by the Maitland Realty Company (and later by the Maitland News Company) which began circulation in April 1926. 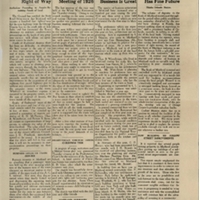 This edition features articles on topics such as plans for a new highway, the growth of new businesses, the final Chamber of Commerce meeting of 1926, the Bank of Maitland's future, safety signs, new buildings, Christmas events, voter qualifying, school notes, library notes, a town council meeting, post office receipts, town progress, the housing arrangements of local residents, and a local events calendar. Also featured are three ordinances and several advertisements for local businesses. Original 6-page newspaper edition: The Maitland News, Vol. 01, No. 34, December 29, 1926: Newspaper Collection, accession number 2014.002.020V, room 2, case 2, shelf 10, box GV, Maitland Historical Museum, Art & History Museums - Maitland, Maitland, Florida. Digital reproduction of original 6-page newspaper edition: The Maitland News, Vol. 01, No. 34, December 29, 1926. “The Maitland News, Vol. 01, No. 34, December 29, 1926.” RICHES of Central Florida accessed April 18, 2019, https://richesmi.cah.ucf.edu/omeka/items/show/6464.